Coloured etching by William Heath of seven people seated round the kitchen table brandishing knives and forks and glases; a woman at one end is carving meat from a large roast; at the other end a man on his feet is holding up a jug. A small boy, standing on a bellows, stretches up to the table to drink from a plate; two others are eating on the floor using a stool as a table. A dog is sitting looking up at the table. Published by T McLean, 1830. 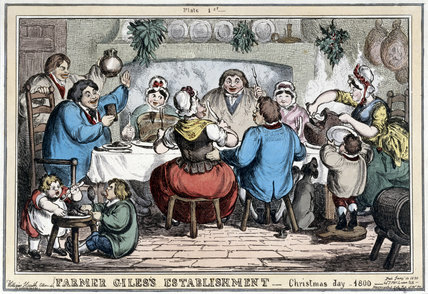 Farmer Giles' Establishment', Christmas Day, 1830. 'Coronation Procession of His Majesty George the Fourth', 19 July 1821.